I'll admit that we don't eat a lot of vegetables in our house; however this is something I've been trying to rectify. I don't really mind zucchini but it's a kind of "new" vegetable to me. Seeing recipes like this have made me think this looks like a good way to reintroduce the summer vegetable in to our meals. Because they're coated with a breadcrumb and cheese mixture before being baked into "chips" they're like a masked version of the vegetable. These will be something I keep in my back pocket if we end up having picky kids! They could make a great side-dish with some burgers (which is how we enjoyed them), or a good after school snack for kids perhaps! Combine breadcrumbs, cheese, salt, garlic powder and pepper in a medium bowl. Place egg and water in a shallow bowl and whisk together. 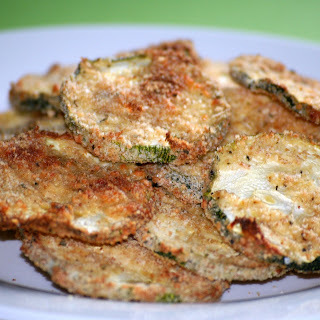 Dip zucchini slices in egg mixture and then dredge in breadcrumb mixture. Place coated slices on an oven-proof wire rack coated with cooking spray, placed on a baking sheet. Bake for 30 minutes or until browned and crisp. I love this idea! It's always good to get new zucchini recipes this time of year. Oh I need to try this recipe! We LOVE zucchini in our home!!! Found you via the nest--new follower!